Marked: Crescent star open to left. Faint disconnected strip, snip. Left for pastern with spot on inside. Right fore heel. Left hind outside heel. Currently Standing Stud: Contact Sally for further details. 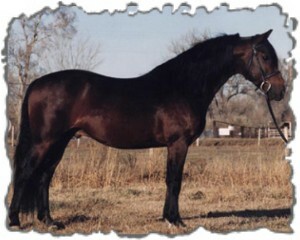 "Skipper" is a true pony sporthorse type. He was the silver medal award winner at the August American Warmblood Society approvals in Absarokee, Montana; and he scored a "9" for temperament. Skipper has competed with success in eventing, dressage, showjumping, and team penning. 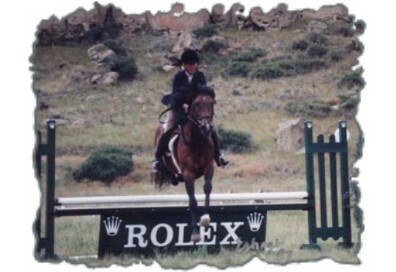 In a 1998 Morgan Show in Bozeman, Montana, he won hunt seat, hunter, jumper, reining, and ranch horse classes. In 1999, he won the Gillette Senior Novice Horse Trials and won high point dressage score at the same show. In 1999, he also won the Gold Medal in the six bar jumper class at the the Montana Big Sky State Games. Skipper has some wonderful full Morgan and half Morgan foals and they seem to have his great temperament and athletic ability. His thoroughbred crosses are exceptional!